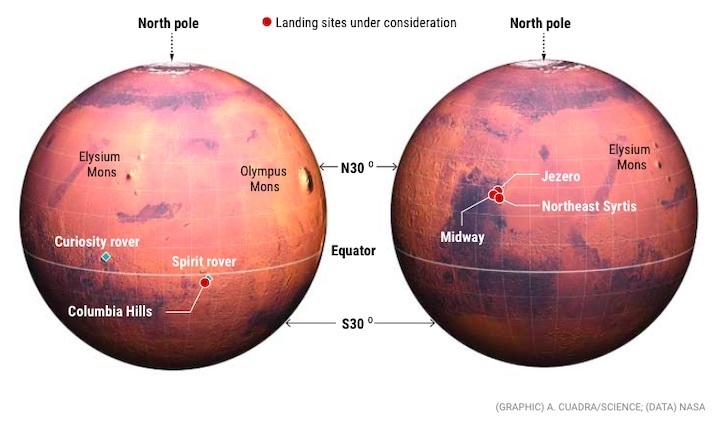 NASA has chosen the landing site for its next Mars rover, which is set to launch in 2020. 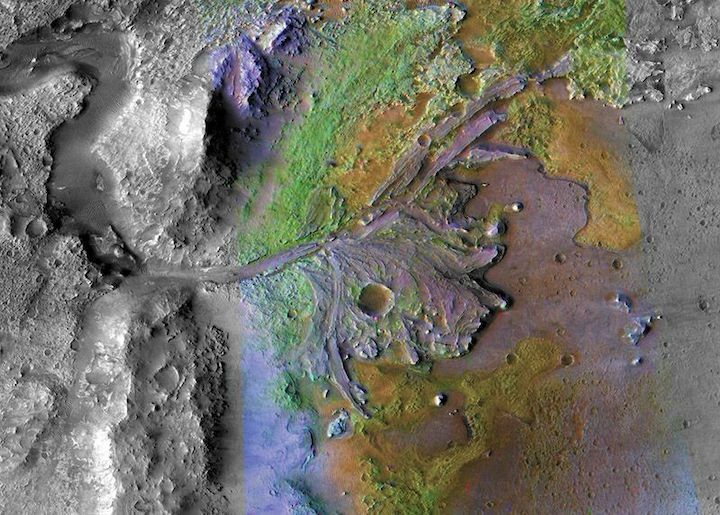 The first spacecraft to collect Martian rocks for eventual return to Earthwill explore Jezero crater, NASA announced on 19 November. Jezero is a 45-kilometre-wide crater that was once filled with water, where Martian life could have thrived. “Getting samples from this unique area will revolutionize how we think about Mars and its ability to harbour life,” says Thomas Zurbuchen, NASA’s associate administrator for science, who chose Jezero over three other finalists. Still undecided is whether the rover would embark on a long drive to a second site after it finishes surveying Jezero. 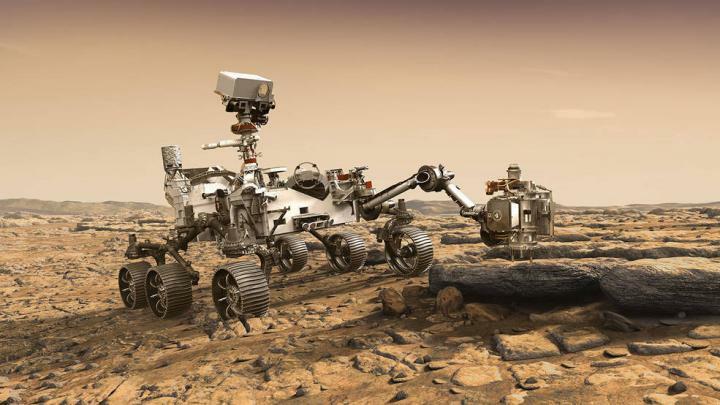 Some scientists want the rover to roll 28 kilometres to a location dubbed Midway, where it could sample some of the most ancient rocks known on the red planet. Either way, the 2020 rover will set the direction of NASA’s Mars programme for years to come, says Lori Glaze, acting director of the agency’s planetary-sciences division in Washington DC. Jezero is also home to carbonate rocks, whose chemistry could reveal how the lake’s water and the Martian atmosphere interacted in the distant past, Farley says. And a wider variety of rocks found upstream could have been swept into the crater, where the rover could study them as well. The varied geology of Jezero and its surroundings helped Jezero to beat out other potential destinations for the 2020 rover. They include Northeast Syrtis, which contains some of the oldest rocks on Mars, and Columbia Hills, which the Spirit rover explored between 2004 and 2011. The US$2.4-billion rover is slated to launch in July 2020 and land on Mars in February 2021. It will carry 37 sample tubes and 5 spares, which it will fill using its robotic arm — an attachment designed to drill long, slender cylinders of Martian rock. The rover will collect a variety of samples as it explores the red planet, and eventually set them down for a future mission to retrieve. NASA has not yet developed a detailed plan for transporting the samples back to Earth. Zurbuchen says that it hopes to send a mission to Mars in the late 2020s to retrieve the rocks, and return them to Earth in the early 2030s. 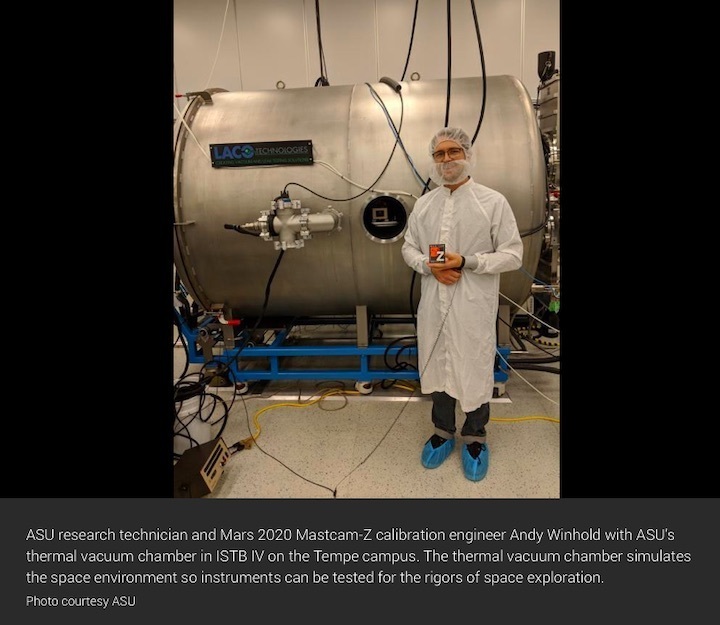 Arizona State University research technician and Mars 2020 Mastcam-Z calibration engineer Andy Winhold waited patiently on the loading dock of ASU’s Interdisciplinary Science and Technology Building IV in anticipation of the arrival of a very special delivery. 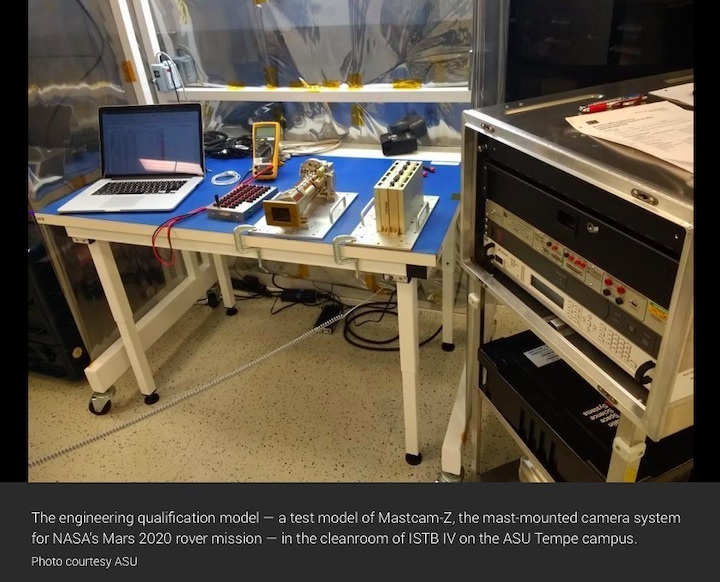 On board the delivery truck was precious cargo from Malin Space Science Systems, a test model of “Mastcam-Z,” the mast-mounted camera system for NASA’s Mars 2020 rover mission. 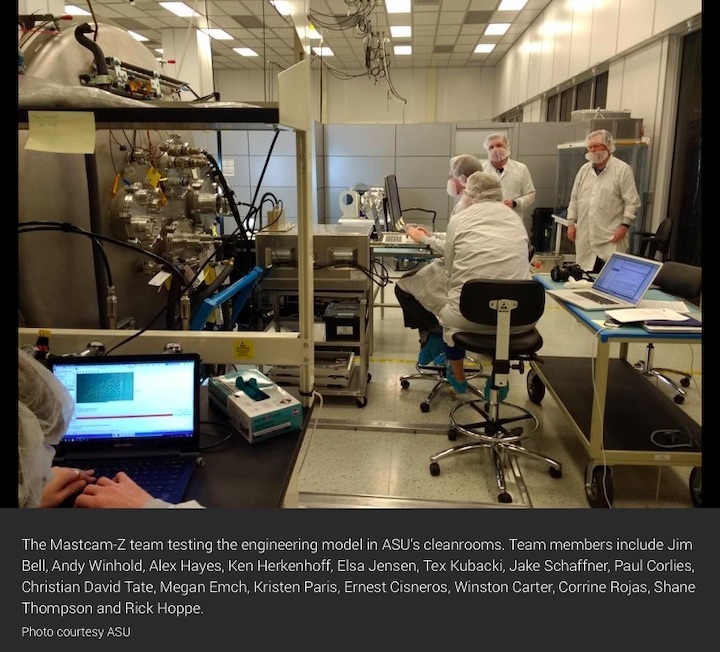 The Mastcam-Z team tests the engineering model in ASU’s cleanrooms. Mastcam-Z is being designed, built and tested under the direction of principal investigator Jim Bell, of ASU’s School of Earth and Space Exploration. The dual camera system can zoom in (hence the ‘Z’ in “’Mastcam-Z’), focus and take 3D pictures and panoramas at a variety of scales. This will allow the Mars 2020 rover to provide a detailed examination of both close and distant objects. The test model that arrived on the Tempe campus in November, otherwise known as an engineering qualification model or EQM, is an important step in designing and building instruments for space. These models not only serve as a way to run the instruments through the rigors of launch and functionality in space, they also serve as a way for the instrument team to evaluate the design and testing plans before the final cameras are fully assembled. The engineering model essentially allows the team to do a "dry run" through the complete design and build process of the instrument before the final versions of the cameras are complete. The team first verifies that the test instrument operates correctly in terms of parts, power consumption and software. They also use the model to ensure the instrument meets mission requirements in terms of functionality, size and weight. 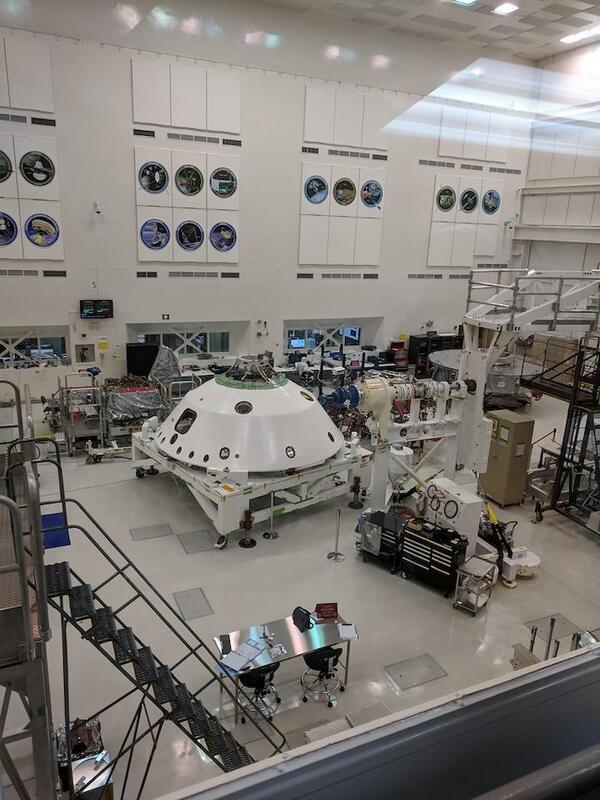 “For Mastcam-Z, one of the primary interests with the engineering model was evaluating the instrument’s ability to change focal length — or zoom,” Winhold said. Specifically, the team tested the engineering model in the thermal vacuum chamber, located in ASU’s Interdisciplinary Science and Technology Building IV, to confirm that their support equipment was designed appropriately and allowed the camera to be placed securely in the chamber and view out the chamber's window clearly. 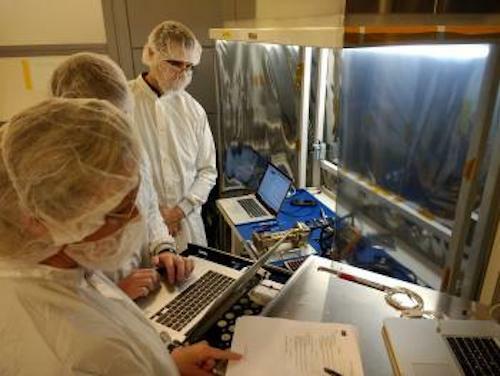 They also timed the tests so they knew how long testing the actual cameras will take, and they tested the IT network's ability to share data quickly between people inside the cleanroom and other support team members outside of the room and around the world. Winhold describes his role on the mission as similar to someone playing the game "Operation," where the patient is the Mastcam-Z cameras and the tweezers are the support pieces. And according to the team, the testing has been a success so far. In December, the actual Mastcam-Z flight cameras will arrive on the ASU Tempe campus for testing. They will then be delivered to NASA's Jet Propulsion Laboratory and installed on the Mars 2020 rover, which will launch in summer 2020, landing on Mars in February 2021. The mission is expected to last at least one Mars year (687 Earth days). 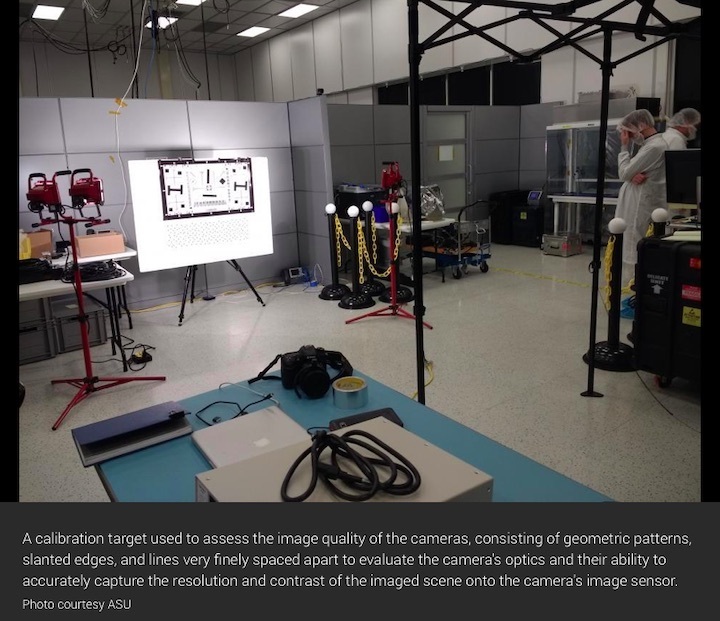 “The tests we ran on the engineering unit at ASU are almost identical to the tests we'll be running on the actual cameras when they arrive,” Winhold said. Once the instrument is finalized and installed in the Mars 2020 rover, the engineering model continues to have a purpose. The cameras weigh about 8.8 pounds and will produce images of color quality similar to that of a consumer digital HD camera (2 megapixels). The cameras will help other Mars 2020 experiments on the rover by looking at the whole landscape and identifying rocks and soil (regolith) that deserve a closer look by other instruments. They will also spot important rocks for the rover to sample and cache on the surface of Mars, for eventual return (by a future mission) to Earth. Mastcam-Z's purpose is to take high resolution panoramic color and 3D images of the Martian surface and features in the atmosphere with a zoom lens to magnify distant targets. It will be mounted on the Mars 2020 rover mast at the eye level of a 6-foot-5-inch person. The two cameras are separated by 9.5 inches to provide stereo vision. These cameras, with their all-seeing sharp vision, will provide images for science team members to pick out the best rocks, to hunt for evidence of past habitability recorded in the geology and texture of the landscape, and to look for signs of past water on Mars. Mastcam-Z’s principal investigator is Professor Jim Bell of the School of Earth and Space Exploration. The deputy principal investigator is Dr. Justin Maki of NASA's Jet Propulsion Laboratory, the Planetary Society serves as the instrument’s education and public outreach partner, and the prime subcontractor for instrument development is Malin Space Science Systems, Inc. The Mars 2020 rover mission is part of NASA's Mars Exploration Program, a long-term effort of robotic exploration of the Red Planet. The Mars 2020 mission addresses high-priority science goals for Mars exploration, including key questions about the potential for life on Mars. The mission also seeks to gather knowledge and to demonstrate technologies that address the challenges of future human expeditions to Mars. These include testing a method for producing oxygen from the Martian atmosphere, identifying other resources (such as subsurface water), improving landing techniques, and characterizing weather, dust, and other potential environmental conditions that could affect future astronauts living and working on Mars. "ST1 was a massive undertaking," said Bottom. "It was our first chance to exercise the flight software we will fly on 2020 with the actual spacecraft components that will be heading to Mars - and make sure they not only operate as expected, but also interact with each other as expected." On the day before ST1 began, the High Bay 1 cleanroom was hopping with "bunny suit"-clad engineers and technicians assembling, inspecting and testing the mission's hardware. The next day, Wednesday, Jan. 16, the room was eerily quiet. The majority of workers had been replaced by two technicians there to monitor the flight test hardware. 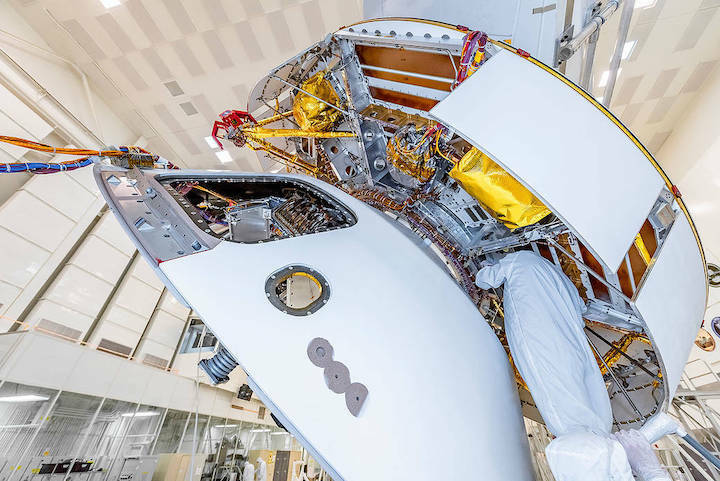 Lines of electrical cabling - "umbilicals" - were added to provide data and power to the spacecraft's cruise stage, back shell, descent stage and rover chassis, which have yet to be stacked together. The ground to in-flight spacecraft (and in-flight spacecraft to ground) communications were handled by X-band radio transmission, just like they would be during the trip to Mars. The Mars 2020 Project at JPL manages rover development for NASA's Science Mission Directorate. NASA's Launch Services Program, based at the agency's Kennedy Space Center in Florida, is responsible for launch management. Mars 2020 will launch from Cape Canaveral Air Force Station in Florida. A member of NASA's Mars 2020 project checks connections between the spacecraft's back shell and cruise stage. 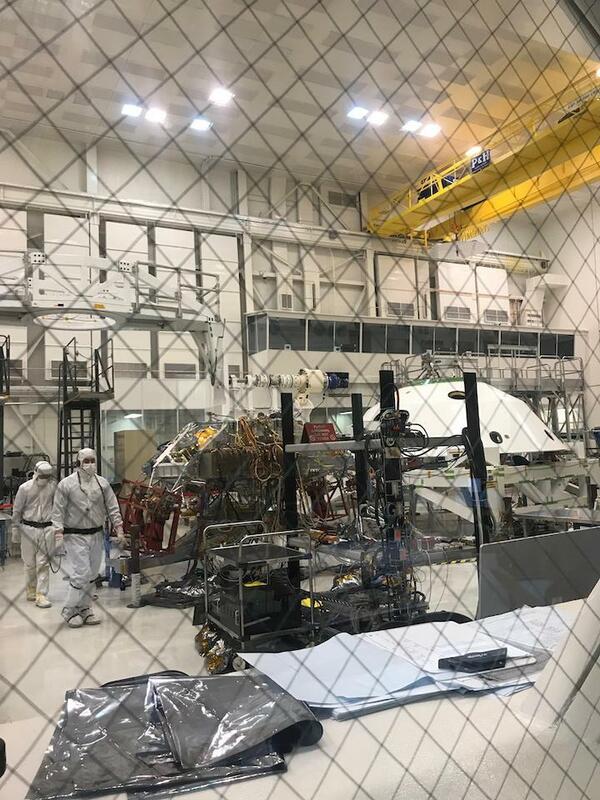 The image was taken on March 26, 2019, in the Spacecraft Assembly Facility's High Bay 1 clean room at NASA's Jet Propulsion Laboratory, in Pasadena, California. During the mission's voyage to Mars, the cruise stage houses the hardware that steers and provides power to the spacecraft. The back shell, along with the heatshield (not pictured), protects the 2020 rover and the sky crane landing system during Mars atmospheric entry. JPL will build and manage operations of the Mars 2020 rover for the NASA Science Mission Directorate at the agency's headquarters in Washington.